You know when you go to the grocery store and you see your neighbor and you're all like, "Oh my gosh! How ARE YOU?! I swear we never see each other anymore except for neighborhood garbage day when we were all getting rid of our junk together. Man, we really bonded over trying to get that enormous television from the 70's- that could also have been mistaken for the wardrobe to Narnia - high enough into the air to actually get it into the dumpster! My gosh! Did you even realize that Old Man Brewster knew words like that?! Hilarious!! Also, how awesome is it that we live in the last neighborhood in America that has a neighbor-man we call 'Old Man Brewster'? I love this world! Ha ha ha ha... Ahh. It's great to see you! I've got to get going...."
And then three seconds later you turn the corner into the next aisle...and there they are again...half way down. And you have to make a decision -- pretend you don't see them and that you also suddenly forgot something in the previous aisle and spend 5 minutes reading the back of the cereal box while trying to determine if they've moved on to another aisle while simultaneously hoping they didn't ACTUALLY forget something from the cereal aisle OR you can acknowledge the awkward situation that you find yourself in over and over again as you cross paths for the rest of the store, getting only half the items on your list in the hopes that it can just be over already. I feel like the changing of the seasons is like that. I've accepted the fact that summer is ending. I've bid it a fond farewell and I'm gearing up for fall and school and HALLOWEEN!!! But then, I turn the corner and wake up the next morning and there it is again. Summer. I mean, I like you and all, but I think I forgot to grab a box of sugar-filled breakfast cereal, you know? Bleh. 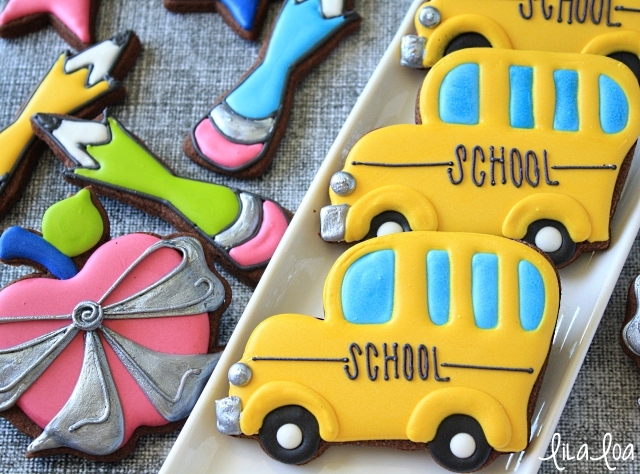 Let's make some school cookies. 1. Use a medium consistency light blue icing and a #2 tip to pipe some windows. Add some white dots for the center of the tires with medium consistency white icing and a #3 tip. Let it dry for 30 minutes. 2. Outline and fill the rest of the cookie with a medium consistency yellow icing. 3. Grab some medium consistency black icing and a #3 tip to pipe the black part of the tire. Don't be too concerned about making the tires perfect because we're just going to cover them up later. Use medium consistency gray icing and a #2 tip to pipe a square for a bumper and a circle for a headlight. 4. Put a #1.5 tip on the black icing and pipe the word "SCHOOL" across the side of the buss. Add horizontal lines to either side of the word to give it the illusion of being centered. Use the yellow icing to add some fenders to the tires. 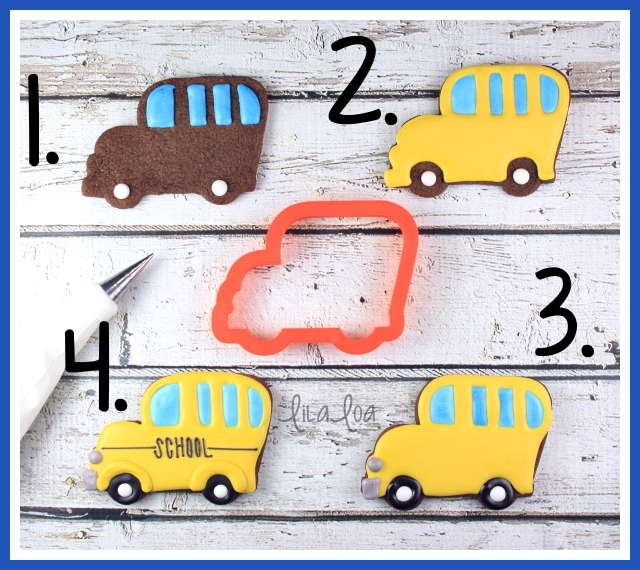 Get the BUS CUTTER, the APPLE BOW CUTTER, or the PENCIL CUTTER. See how to make the pencil cookies. Learn how to make the most perfect bow cookies ever!